If you have a thing for smooth, decadent desserts, you will love Smash Mouth by Humble Juice. It is a combination of fruity, creamy and pastry flavor. This e-liquid will captivate your taste buds from your very first puff. The flavor of this e-liquid is out of this world. It has excellent cloud production, and the throat hit is nice. Smash Mouth is one of those e-liquids that you can easily vape all day long without getting sick of how it tastes. Smash Mouth by Humble Juice is a blend of ripe strawberries, smooth custard, and crispy Graham crackers flavor. These three flavors are mixed in the right proportions to create a yummy and refreshing dessert. This can easily be an all day vape. Unlike most custard vapes, the custard flavor in this e-juice does not overpower the strawberry and Graham crackers flavor. Also, it is not too sweet, and there is a bit of sourness to this vape. You can easily vape it all day long. When vaping Smash Mouth, you can taste the sweet strawberry flavor with a hint of creamy custard in the background. On the exhale, the custard comes out more along with the Graham crackers flavor. This taste of this e-juice is authentic. Some vapers have compared the taste of this Humble Juice e-liquid with that of a strawberry milkshake or a strawberry shortcake. It is simply amazing. Smash Mouth has a vegetable glycerin (VG) and propylene glycol (PG) ratio of 80/20. Although this is a MAX VG e-juice, the flavor is not weak. You will be blown away by the taste of this e-liquid whether you vape it using a sub ohm tank or a rebuildable dripping atomizer (RDA). If you are a flavor chaser, I suggest you vape it with a dripper. Smash Mouth is easy on coils. It comes pre-steeped from the factory so you can start vaping as soon as it is delivered at your doorstep. If you are not satisfied with how it tastes, feel free to steep it again for a few days or weeks. Smash Mouth comes with varying nicotine strength levels. You can get this e-liquid with either 0mg, 3mg or 6mg of nicotine. It has a light throat hit even if you go for the version with 6mg of nicotine. If you want a hard throat hit or stronger nicotine buzz, you can mix this e-liquid with a nicotine booster or with another e-juice that has a higher nicotine concentration level. Smash Mouth has an attractive packaging design like other e-liquids in the Humble Juice series. It comes in a black cardboard box with colorful designs. You will find the name of the different flavors on the box along with the brand name, flavor name, bottle size, and other information. Inside the box, there is a chubby gorilla unicorn bottle. Humble Juice is one of the most recognizable brands in the vaping industry. The company creates its e-liquids with high-quality ingredients like natural and artificial flavoring, USP vegetable glycerin, USP propylene glycol, and USP NicSelect Nicotine. Humble Juice has up to 10 top-selling e-juice brands to its name. Apart from Smash Mouth, some other e-liquids in the original Humble Juice series are Donkey Kahn, Blue Dazzle, Pee Wee Kiwi, Humble Crumble, Hop Scotch, Unicorn Treats, Sweater Puppets, American Dream, Berry Blow Doe, and Vape the Rainbow. Humble Juice does not only make some of the best e-liquids on the market, but the company’s prices are very affordable. You can get a 120ml bottle of Smash Mouth for just $24.99 at https://humblejuiceco.com/. This company is currently offering a buy one get one (BOGO) deal which entitles you to two bottles of e-juice for the price of one. Take advantage of this offer now and stock up on your supply of premium e-liquids. You have heard about CBD in vape juices, tinctures, and even gummies, but do you know CBD wax dabs also exists? I did not believe this at first until I saw actually saw the product at the CBDfx online store. So to satisfy everyone’s curiosity, this is my review. CBD wax dabs from CBDfx are raw dabs that look like an eyebrow pomade to me. Each pot contains 300mg of CBD. The color of the wax is dark amber. You will need a specialist dab equipment to use to vape the wax dab. If you do not know where to get one, CBDfx has mini CBD wax pens for sale at $54.99 only. Using the mini CBD wax pens ensures that you will get a pure, concentrated dose of CBD. It was really effective for me. After a couple of puff, I started feeling the effects. I use CBD to help me sleep at night and to combat my migraine. Using CBD wax dabs offers a fast and effective remedy. I vape it a few minutes before bedtime. It is also cost-effective since you will only need a small amount of wax to vape. In fact, the 1 gram pot is good for around 20 servings, enough to last between 2 and 3 weeks. But what if I don’t vape? Not everyone is into vaping and not everybody is willing to spend on a dab pen. Don’t worry, CBD wax can actually be taken orally. You got that right! You can ingest a pea-sized amount of CBD wax and hold it under your tongue before you swallow it. While ingesting CBD wax dab is possible, it is not as effective as vaping. The amount of CBD absorbed into the bloodstream depends on the method of administration. The bioavailability rate of consuming CBD orally is only between 4% and 20%. To give you an idea of how this works, if you eat a CBD gummy with 100mg of CBD, only around 4mg to 20mg reaches your bloodstream. The rest is lost during the digestion process. The bioavailability rate of taking CBD sublingually is similar to taking it orally. The reported range is from 12% to 35%. Meanwhile, vaping CBD is second to intravenous injection when it comes to the absorption rate. The bioavailability rate of vaping CBD is somewhere between 34% and 56%. The bioavailability rates above explains why vaping CBD wax dab produces a more desirable result than ingesting it. California-based firm CBDfx is known for making different CBD products. You can check them out at https://cbdfx.com/. The company produces CBD gummies, tinctures, hand lotion, and even CBD products for pets. CBDfx uses only organically grown hemp plants to create its CBD products. The company’s products are 100 percent natural and do not contain any harmful chemicals. Each pot of CBD wax dab contains 300mg of CBD with 30% CBD oil. It is not only rich in cannabinoids but also in other healthy nutrients like essential amino acids and terpenes. You can order a pot of concentrated raw dabs for only $49.99 at the CBDfx online store. If you get a set that includes a mini wax dab pen, it will only cost you $94.98. CBDfx raw wax dab helps me get better sleep at nights thereby improving my mood in the morning. I believe this is one of the most effective forms of CBD. Also, you will be surprised at how long that small pot could last. Many people like desserts with pasty treats, but that’s not me. My definition of a perfect dessert is a blend of the natural sweetness that of a trifecta of fruits: bananas, strawberries, dragonfruit! The mixologists at Humble Juice did an amazing job creating Donkey Kahn. This is a scrumptious blend of bananas and strawberries with a hint of dragonfruit flavor. These blend of these different fruits would excite your taste buds. Donkey Kahn is quite a treat. Each puff of this Humble Juice Co. e-liquid gives you a refreshingly sweet flavor. You can taste all the different flavors. I am so happy that I discovered this vape juice. It’s unbelievably delicious! This is surely an all day vape. I like the fact that it’s not too sweet. The dragonfruit flavor is a great addition to this blend. You will find many banana and strawberry e-liquids on the market, but none of them also come with dragonfruit flavor. I was not disappointed at all with this e-juice. It doesn’t come off artificial in any way. The flavor is not overwhelming. The different flavors are well-balanced. I’m on my second bottle of Donkey Kahn. The yummy banana really stands out in this e-juice. It adds a creaminess to the blend. I am totally in love with it. The best part is that Donkey Kahn is not a coil killer. Donkey Kahn is a premium e-liquid from one of the best e-juice makers in the industry. All Humble Juice e-liquids are made in the USA with top-shelf ingredients including NicSelect Nicotine, USP vegetable glycerin, USP propylene glycol as well as natural and artificial flavoring. Donkey Kahn by Humble Juice Co. is a MAX VG e-liquid. It is a blend of 80 percent vegetable glycerin (VG) and 30 percent propylene glycol (PG). Every Humble Juice e-liquid is steeped for two weeks or more before being shipped. However, if you buy a bottle of Donkey Kahn and you’re not satisfied with how it tastes, I recommend that you steep it again. Donkey Kahn is available with three different nicotine strength levels. You can get this e-liquid with either 0mg, 3mg or 6mg of nicotine. The throat hit is mild. I don’t get any throat irritation at all. If you love fruity desserts like me, you will fall in love with Donkey Kahn. I am hooked with its authentic flavor. The fusion of different fruits is impeccable. Donkey Kahn comes in a chubby unicorn gorilla bottle with a childproof cap. The packaging design is simple and attractive. The Humble Juice logo is printed on the bottle along with the flavor name, VG/PG ratio, nicotine level, and more. The bottle is packaged in a black box with colorful designs. You can get a 120ml bottle of Donkey Kahn for only costs $24.99 at the Humble Juice online store. This company has a wide array of e-juice flavors under different lines. Check them out at https://humblejuiceco.com. Humble Juice is currently offering a special BOGO (buy one get one) deal that allows you to get two bottles of e-juice for the price of one. Treat yourself to this delectable blend of banana, strawberry, and dragonfruit today with Donkey Kahn by Humble Juice Co. I promise you won’t be disappointed. How I wish that finding the perfect vape juice is as easy as reading the flavor description stated by the manufacturer. There are tons of artificial and natural fruit flavorings out there, and e-liquid makers love to tinker with them. I wanted to find the best fruity vape liquids in the market. I have spent months testing one brand after the other. But if you come to think of it, even if I try one flavor every single day, I still wouldn’t get through all of them anytime soon. However, a good friend of mine knew about this crazy journey of mine and decided to help. Together, we found HMBL Juice and agreed that this brand is one for the book. This e-liquid line passed our standards with flying colors. After discovering this line, some of its e-liquids were instantly added to our rotations. As a candy lover, one of the e-juice flavors that appealed to me is Strawberry Sour Belt Salt. This strawberry candy e-juice will take you down the memory lane. How? Remember those candy belts sprinkled with sugar; this vape juice has the same flavor. It will remind you of your favorite childhood treat. According to its flavor profile, Strawberry Sour Belt Salt is a “mouth-wateringly sweet strawberry candy sprinkled with sour sugar.” The e-juice contains natural and artificial flavorings, USP propylene glycol, USP vegetable glycerin, and USP proprietary nicotine salts. Who doesn’t crave for candy belts? Strawberry Sour Belt has the taste of a delightful strawberry candy sprinkled with a generous dose of sugar. Its sweet and sour taste will keep you vaping this baby all day long. This vape juice is very easy to fall in love with. Each puff fills your mouth with the yummy taste of strawberry and sugary candy. It will surely satisfy your sweet tooth cravings. After spending a couple of days vaping this e-liquid, we both agreed that Strawberry Sour Belt is the bomb. Truly, it lives up to expectations. On the inhale, you can taste a sweet strawberry flavor. On the exhale, there is a complete switch. It gives you a slightly sour and sweet taste. Overall, this is a beautiful blend! It has no sharpness. You will get the same soft and flavorful strawberry sour belt flavor throughout. Using the right tank and coil, the cloud production of this vape juice is insane. Did I mention that this is a blend of 65% vegetable glycerin and 35% propylene glycol? Usually, cloud chasers go for e-liquids with a higher VG ratio, but this one will impress you. If I did not read the label, I would not have known that this is a 65vg blend. It produces huge clouds of vapor, and they do not disperse right away. As for the throat hit, I can feel it a little. I love the fact that it is not overpowering at all. At 3mg, it is just enough to let you know it is there. You can also get Strawberry Sour Belt with 0mg or 6mg of nicotine. HMBL Juice truly has earned a place in the vaping world thanks to the outstanding quality of its vape liquids. The line offers a collection of enjoyable e-juice blends. Although not everyone will love the same flavor, I am pretty sure there is something here for everybody in this series. We got three e-juice blends from this series, and so far, I can say that HMBL Juice is a superb line. If you look at the e-liquids in the HMBL Juice line, you will notice that they have a simple flavor profile. The flavor descriptions do not contain any hyperbole. But they will give you an out-of-this-world vaping experience. Overall, I am giving Strawberry Sour Belt Salt a score of 5 out of 5 stars. If I were to make a strawberry candy e-juice, I would love to make something as good as this. Strawberry Banana Milkshake by Bantam Vape is an exciting e-liquid that will captivate your taste buds from your first hit. This e-liquid is a blend of ripe strawberries, bananas, and milkshake flavor. This premium vape juice is recommended for dessert lovers. It has a smooth, sweet and creamy taste that doesn’t get old. This is a unique vape juice. Each hit gives you the same yummy flavor. Strawberry Banana Milkshake by Bantam Vape is a classic. It has a realistic flavor. It does not taste artificial at all. This is surely an all day vape. On the inhale, the ripe strawberry flavor comes alive. As the flavor settles in your mouth, the sweet banana flavor blends with the slightly tart strawberry. The milkshake flavor is in the background and adds a creaminess to the blend. You get the milkshake flavor on the exhale. This e-liquid has a delightful taste that is almost addictive. Don’t be surprised if you finish a bottle in a short time. Bantam Vape is based in North Carolina. This vape juice company makes some of the best e-liquids in the industry. Bantam Vape has a team of highly experienced mixologists who create outstanding e-liquids using high-quality ingredients like USP vegetable glycerin, USP propylene glycol, and food-grade flavoring. Bantam Vape only uses ingredients sourced from the US to produce its e-juice flavors. Bantam Vape has an impressive collection of e-liquids on the market. Strawberry Banana Milkshake is a part of the Bantam Strawberry e-juice series. Apart from Strawberry Banana Milkshake, some other e-juice flavors in the Bantam Vape Strawberry series are Strawberry Shortcake with Whipped Cream, Strawberry Limeade, Strawberry chew, and Strawberry Ice. The company also has a watermelon e-juice series and a tobacco e-juice series. Strawberry Banana Milkshake by Bantam Vape is a MAX VG e-liquid. It exact vegetable glycerin and propylene glycol ratio of this vape juice is unclear. Strawberry Banana Milkshake works well with most vaping devices. You can choose to vape it using a sub ohm tank or a rebuildable dripping atomizer (RDA). You can vape Strawberry Banana Milkshake for a long time without having to deal with coil gunk. This e-juice is not a coil killer although it is sweet. This Bantam Vape e-juice produces dense clouds of vapor. If you are a cloud chaser, this vape juice will take you to cloud nine. It produces enough thick clouds for you to impress your buddies with your cloud chasing skills. Strawberry Banana Milkshake by Bantam Vape is produced with high-quality nicotine and comes with different concentration levels. You can get this strawberry e-juice with either 0mg, 3mg or 6mg of nicotine. The nicotine level that you select will determine the kind of throat hit you will get from this e-juice. Overall, Strawberry Banana Milkshake is smooth on the throat. You will get a mild throat hit from vaping it. Strawberry Banana Milkshake by Bantam Vape has an elegant packaging design. This e-juice comes in a plastic gorilla unicorn bottles. There is a blue label on the bottle with the Bantam Vape logo, the flavor name, and some other basic information about the product. The bottle of e-juice comes packed in a cardboard box. You can buy a 60ml bottle of Strawberry Banana Milkshake for only $19.99 at bantamvape.com. Studies have revealed that using cannabidiol (CBD) to treat different kinds of pain can be effective. The marijuana plant has been utilized for thousands of years already, but the medical community has just recently started to discover the properties of cannabidiol. When we talk about pain, CBD is known to help deal with arthritis pain, multiple sclerosis, and chronic pain. It also has promising possibilities for treating anxiety and seizure, to name a few. So how can CBD relieve pain? Studies show that CBD interacts with certain receptors in your brain. These receptors attach to your cells. They receive chemical signals from various stimuli and help your cells respond. They trigger anti-inflammatory and painkilling responses, thus, alleviating pain. There are several studies on CBD pain relief. Most of them have looked at CBD for relieving chronic pain, arthritis pain, and even cancer treatment. However, as they say, experience is the best teacher. So, I tested the efficacy of CBD oils for pain. And I have chosen the CBDfx brand because the company has many positive reviews. It is impossible to be the talk of the town if you are not good. Here is my first-hand experience with CBDfx Tincture: I will say that this product works for me. I usually experience migraines because of stress and lack of sleep. But when I started using this, I felt gradual improvements in my pain experience as well as my sleeping patterns. My migraine episodes also decreased, and I can sleep as soon as I hit the sack. I feel rested the following day. When using CBD Tincture, expect some minimal to non-existent side effects. The most common ones include weight gain/loss and appetite changes. I have been using this for nearly three weeks now, and I have not experienced any of these. However, I cannot vouch for the product. We are all made unique, and I think our responses to the supplement may vary. That being said, I highly recommend that you give CBDfx’s CBD Oil a try. I got mine at https://cbdfx.com. CBDfx Tincture comes with three different CBD concentration levels. It is available with 500mg, 1000mg, and 1500mg of CBD at a price of $74.99, $124.99, and $159.99 respectively. If you want to save some bucks, you can go for the trio pack for $314.99 only. Bundle includes a bottle for each concentration. Here is a tip to save some money. Getting the highest concentration may sound expensive, but it is potent, so you need to use only a small quantity. And the less tincture you use, the longer your bottle will last. CBDfx’s CBD Tinctures can be taken orally or added to food or beverage. The recommended dosage is one full dropper per day. By the way, consider placing the tincture under the tongue (sublingually). As for the taste, it is quite hard to describe the flavor. I get an earthy, tea taste. Some may find it intolerable, but CBDfx oil has a lighter taste compared with other brands. The CBD industry is growing rapidly as the demand is increasing. That’s why you need to make sure that you are patronizing a trustworthy brand. I cannot guarantee that CBDfx Tincture will work for you as it did for me. But there is one thing I am pretty certain: CBDfx offers some of the best CBD products on the market. The company makes a variety of CBD products including tinctures, concentrates, gummy bears and vape juice additives. CBDfx makes vegan-friendly CBD products. Yes, its products are formulated 100% vegan. Its CBD oil is extracted through a supercritical CO2 extraction method to ensure that it is of premium quality. When you are purchasing your ecig, there are a couple of things that you need to know so that you can purchase the best vape pen possible. Because there are a large variety of vape pens that you can purchase, there are many people that don’t really know which one they should buy. With this guide, you will know the important things that you should look for in your vape pen. When you are purchasing your vape pen the one thing that you should consider is what type of product can you vape with. The best option is to choose the pen that is giving you more than one option for vaping. You need to make sure that the vape product that you are going to vape with is easy to find and not that expensive. Otherwise, you might encounter some problems when you need to purchase the refills. The last thing that you want is to purchase something that doesn’t have a great battery life. You don’t want to vape for a couple of minutes to find that the battery has died, again. You should make sure that the battery life of the ecig that you are going to purchase has a long life and that you can vape for the day, without the need to recharge it. This is an option that not many people know about. There is two basic type of vape pens available. The one is a portable vape pen that you can take with you, where you are going. The other one is a desktop vape pen, where you don’t really have to take it where you are going. If you want to vape just at home, the desktop one will the best option. However, if you are going to use the pen at work, and wherever you are going, then the portable one will be the best option. The other thing that you should consider, is what the reviews are saying about the ecig. Is this something that most people are recommending, or are this a vape pen that isn’t recommended at all? This is something that you should consider. You don’t want to purchase an ecig that isn’t going to work for you. Having something that has good reviews, is your best option. Because there are so many vape pens that you can choose from, it can be hard to choose one that you will use all the time. There are a couple of things that you should look for. These mentioned things will ensure that you are going to find the best vape pen on the market that you can use for hours on end. Don’t purchase your pen without making sure that you are buying something that you can use for a long time. A last tip is that you should make sure that the vape pen is affordable to refill as well, otherwise you aren’t going to use it frequently. If we are talking about fruity desserts, then Pacha Mama’s Peach Papaya Coconut Cream is a must mention. This e-juice is a combination of sweet fruits and smooth coconut cream. The creamy background complements the tropical fruity flavor of this e-liquid to give you something truly special. Peach Papaya Coconut Cream is summertime vape. This is the kind of e-liquid to puff on when you want to have fun under the sun. One of the things that make Peach Papaya Coconut Cream by Pacha Mama special is the different flavors are well-balanced. The e-juice does not taste artificial. It is neither too sweet nor too creamy. The flavor is just perfect. You may have tried other e-liquids with a similar flavor, but I can assure you that this one is different. Peach Papaya Coconut Cream has a fresh, vibrant flavor that doesn’t get old. Peach Papaya Coconut Cream has a beautiful taste that stays consistent with each hit. The exotic flavor of this dessert e-juice will impress you. I can’t get enough of its sweet, creamy taste. This e-liquid doesn’t taste artificial. If you buy a bottle of Peach Papaya Coconut Cream and the flavor is lackluster, try steeping it for a few days or weeks. Charlie’s Chalk Dust is one of the top e-juice makers in the industry. The company creates some of the best e-liquids on the market. Chalie’s Chalk Dust Pacha Mama lineup consists of tropical e-liquids. There’s also the Meringue line that is made up of dessert vapes. You will be delighted by the taste of Peach Papaya Coconut Cream whether you choose to vape it using an RDA or a sub ohm tank. I enjoyed vaping it with a tank. I find that the creaminess comes out at a high wattage. This e-liquid is not a coil killer, so you don’t need to worry about gunked up coils when vaping it. The vapor production of Peach Papaya Coconut Cream is terrific. You’ll get massive clouds of vapor from every hit. If cloud chasing is your thing, then this is an e-juice for you. The packaging design of this e-liquid is quite simple and attractive. Pacha Mama’s Peach Papaya Coconut Cream comes in a gorilla unicorn bottle. There is a label on the bottle with the Pacha Mama and Charlie’s Chalk Dust logo as well as all the usual information like the nicotine level, VG/PG ratio, bottle size, and more. The bottle is designed to enable you to refill your tank or RDA without any spilling. 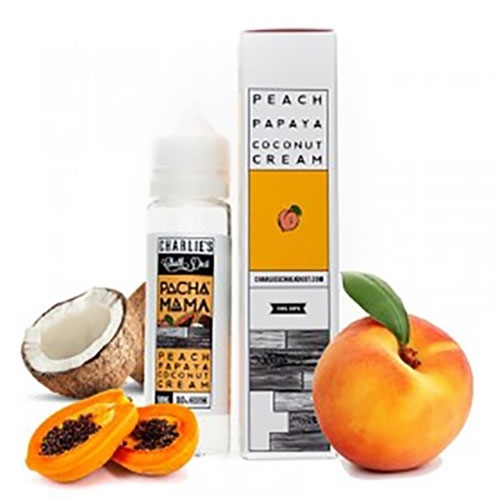 Peach Papaya Coconut Cream by Pacha Mama comes with varying nicotine strength levels, so there is a version of this e-juice for every vaper. You can choose either 0mg, 3mg or 6mg of nicotine. This vape juice ha a light throat hit. I did not get a strong throat hit even from the 6mg version. I think the throat hit is just perfect – especially if you plan to chain vape on this e-juice. You can get a 60mL bottle of Peach Papaya Coconut Cream at the Smoking Things online store for only $21.99. This is a great price for this e-liquid. When you shop at smokingthings.com, you will get the best customer service. Also, orders are shipped quickly. Humble Crumble by Humble Juice will remind you of grandma’s homemade blueberry cobbler. It is a combination of blueberries and just the right amount of pastry flavor. This is the perfect e-juice to enjoy alongside a cup of coffee or your favorite beverage. Humble Crumble is a combination of blueberries, cinnamon and graham crackers flavor. When vaping this e-juice, you get the sensation of a buttery flavor melting on your tongue. The sweet and tart taste of blueberries mixes perfectly with the spicy cinnamon and crunchy graham crackers flavor. The flavor of this e-juice is bold, but it does not get overwhelming. Humble Crumble is one of the best blueberry cobbler e-liquids on the market today. It is irresistibly delicious even at a high-wattage. It will remind you of indulging in a warm cobbler straight out of the oven. The notes are spot-on. The cinnamon flavor isn’t overpowering, and there is a slight creaminess to the blend. The vape juice is quite smooth on the throat. Humble Crumble by Humble Juice comes with different nicotine strength levels. You can opt for either 0mg, 3mg or 6mg of nicotine. When vaping this e-liquid, there is no harsh sensation at the back of your throat. I did not feel any itching or burning. Humble Crumble is pre-steeped for at least two weeks before it hits the shelves. However, you can choose to steep this e-liquid again to bring out the flavor a bit more. Humble Crumble has a vegetable glycerin (VG) and propylene glycol (PG) ratio of 80/20. This e-juice is quite thick, but it is not hard on coils. The vapor production of Humble Crumble is abundant. This e-liquid produces the kind of thick vapor that cloud chasers dream about. You can get a 120ml bottle of Humble Crumble for only $24.99 at the Humble Juice Co. online store. This is a low price for this premium e-juice. Humble Juice offers many exciting deals like its BOGO offer. The Humble BOGO (buy one get one) free deal allows you to get two bottles of any Humble Juice e-liquid for the price of one. Apart from Humble Crumble, some other e-liquids in the Humble Juice series are American Dream, Smash Mouth, Sweater Puppets, Berry Blow Doe, Donkey Kahn, Hop Scotch, and Pee Wee Kiwi. Humble Juice has other e-juice lines on the market like the Hustle Juice series, the Havoc Juice series, the Havana Juice series, the HMBL Juice series, and more. If you are a retailer, you can apply for wholesale prices from Humble Juice Co. This will give you an edge over your competitors and also increase your profit margin. If you like dessert vapes, particularly sweet pastry treats, you must try Humble Crumble. The taste of this e-liquid is sublime. It is indeed a mouth-watering vape. You can easily vape it all day long without getting tired of how it tastes. Humble Juice is a US-based e-juice maker that makes some of the best e-liquids on the market using the finest ingredients. Humble Juice has an in-house distribution network that allows the company to increase efficiency and reduce cost. All its e-liquids are a must-try. Twelve Steps by Vape Craft Inc. is a summer vape juice. This e-liquid is a juicy, sweet and sour summer treat. Twelve Steps is a blend of honeydew melon, apricot, lemon, and lime flavor. This is a mouth-watering vape juice. The exciting flavor does not get old. I was impressed with the flavor of Twelve Steps from the moment that I tasted it. If you are looking for a sour fruity e-liquid that you can vape all day, this is a good choice. Twelve Steps has a rich natural taste that does not change whether you are vaping at a high or low wattage. Twelve Steps tastes precise as the flavor description reads. On the inhale, you can taste the apricot and honeydew melon flavor. On the exhale, the sour citrus flavor comes to life. Twelve Steps has a well-balanced flavor. It is recommended for vapers who love sour e-liquid flavors. While it is sour, the sourness does not get too much to bear. Twelve Steps is manufactured in the United States by Vape Craft Inc. This vape juice producer has a reputation for producing unique e-liquids. Vape Craft Inc. creates some of the finest budget e-juice flavors on the market using high-quality ingredients. The company released its first e-juice flavors in 2013. The Vape Craft Inc. store is easy to navigate. You can place an order within a few minutes. The best part is that this company provides excellent customer service and fast shipping. Twelve Steps by Vape Craft Inc. has a vegetable glycerin (VG) and propylene glycol (PG) ratio of 70/30. This e-liquid is suitable for vaping with a sub ohm tank or a rebuildable dripping atomizer (RDA). It will not stain your coils quickly like some other e-juice blends with a similar flavor profile. You can vape Twelve Steps for a long time before you will need to clean your coils or change your wicking material. Twelve Steps is one of those e-liquids that cloud chasers would love. This vape juice produces massive clouds with every hit. This is the perfect e-juice to vape when you want to practice cloud tricks. Vape Craft’s Twelve Steps comes with varying nicotine concentration levels. You can get this e-juice with either 0mg, 3mg or 6mg of nicotine. Twelve Steps has a smooth throat hit. This vape juice is not harsh on the throat. I did not experience any throat irritation at all while puffing on this e-liquid. Twelve Steps by Vape Craft Inc. comes in gorilla unicorn bottle with a child-resistant dropper cap. There is a blue and green label on the bottle with images of the different fruit flavors as well as the Vape Craft Inc. logo and some other relevant details about the product. You can buy a 60ml bottle of Twelve Steps from the Vape Craft Inc. official online store for $22.99. If you buy a bottle of Relapse, let it steep for at least two weeks before you vape it. Steeping will dramatically improve the flavor of this e-juice so you can enjoy it to the fullest. Copyright 2018 VAPOR JUICE DIRECT. All Right Reserved.